You might wonder why I’m showing an image of the biscuits, but they need to be talked about. They are by far the best biscuits that I’ve ever had any at restaurant. They’re really crunchy on the outside and soft and moist on the inside. The soft butter and homemade jalapeno jam is just right for them. I have to warn you that they are really addictive, so I’d wait to have these with your meal instead of before your meal. Otherwise, you’ll fill up on them. 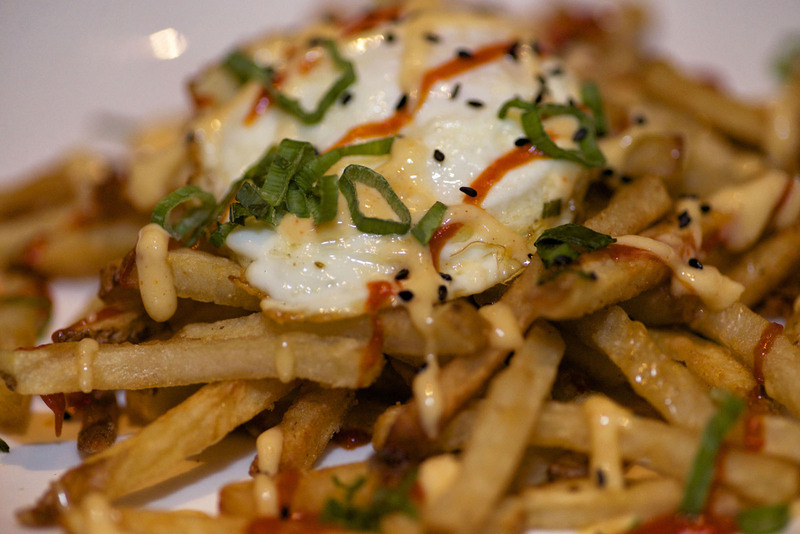 The Kim Chi fries were on the appetizer list currently. 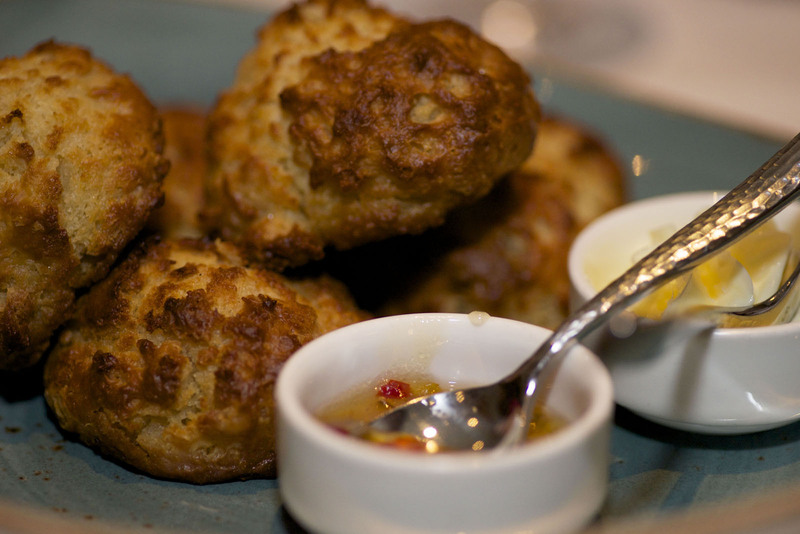 They’re good, but they aren’t a version of Kim Chi fries that you’d expect a fine dining restaurant like this. They just had a small egg over them with some seasoning that didn’t give the appetizer anything to brag about. The fries are good, but what Kim Chi fries aren’t good? I’d stay away from this appetizer personally. 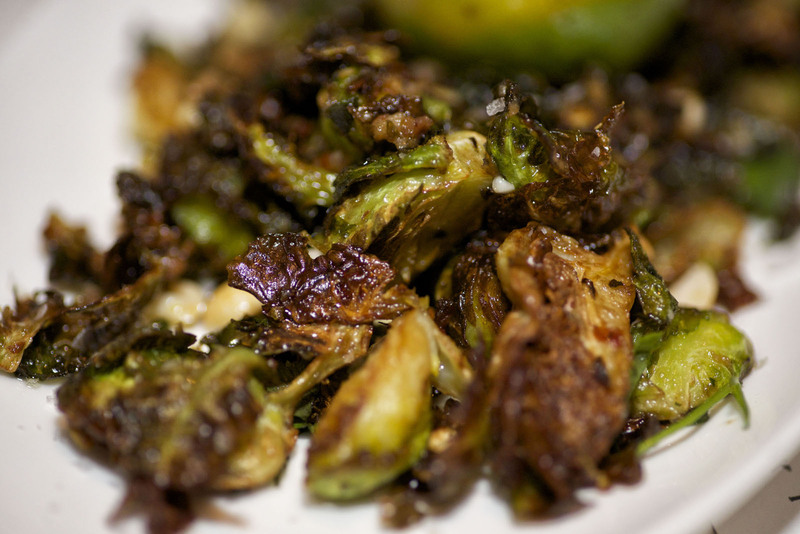 Here below we’ve got their Flash Fried Brussels Sprouts from the appetizer menu. Everywhere I go I always have to order Brussels sprouts. I thought these were terrific. I prefer my Brussels to be crunchy on the outside and soft on the inside. And that’ show it was here. The seasoning and flavors were well put together and they used a special Chinese sauce. 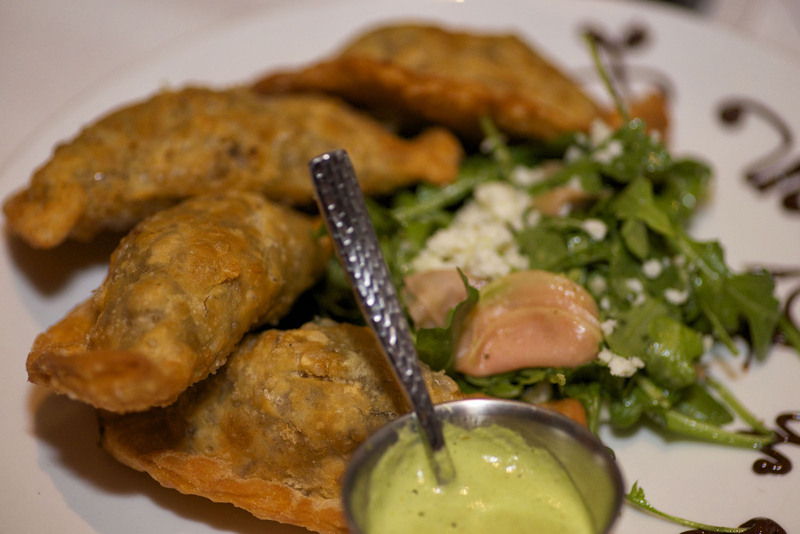 This is the Braised Goat Empanadas. And I must say, they were exceptional. 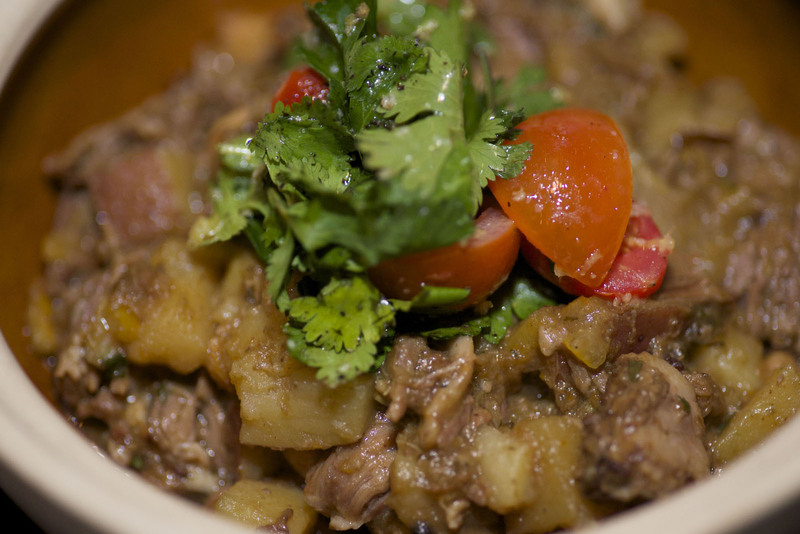 It has a really crunchy exterior with an exquisite filling of tender goat meat that tastes delicious. They’ve got avocado, guajillo, radish, arugula, and charred tomatillo salsa with the dish. This is their Slow Cooked Pork Shoulder. 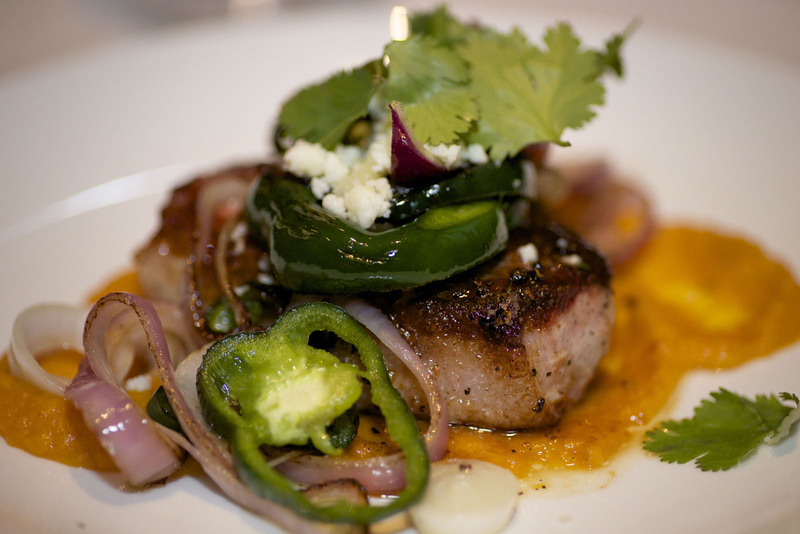 It is served over a bed of citrus mojo and sweet potato puree. The pork chop itself could definitely be a lot more tender and juicy. The Moraccan Lamb Tangia was served in a nice pretty clay bowl. Once the server removed the lid, you can smell the saffron and the spices. It has a very nice juicy flavor. The surprising flavor that took over my mouth was a citrus flavor, which was from the preserved lemons. It wasn’t the kind of taste that you expect from a Mediterranean dish, but I really liked it. The grouper isn’t an item on the menu, but it’s a great choice when it’s on the special. The grouper in this picture was over a butternut squash puree. It wasn’t anything extravagant, but it isn’t supposed to be. 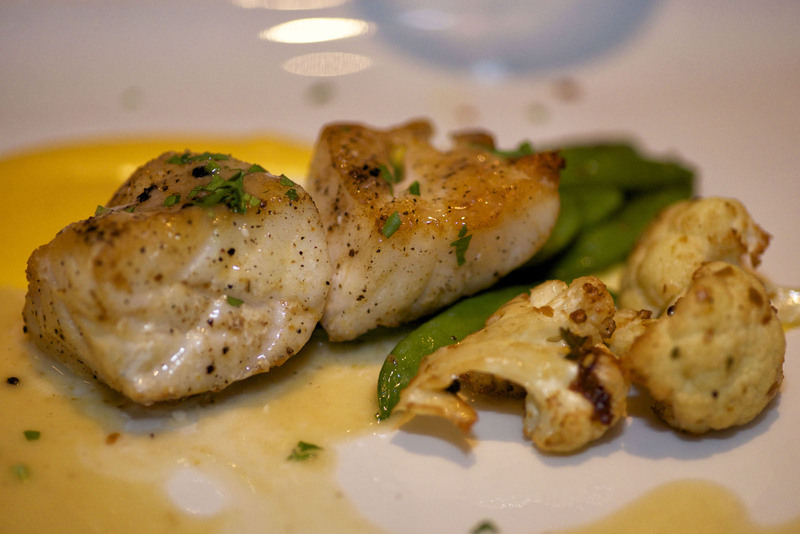 It is there for you to taste the fresh flavor of the grouper and how well it’s prepared. The puree is excellent with the fish. 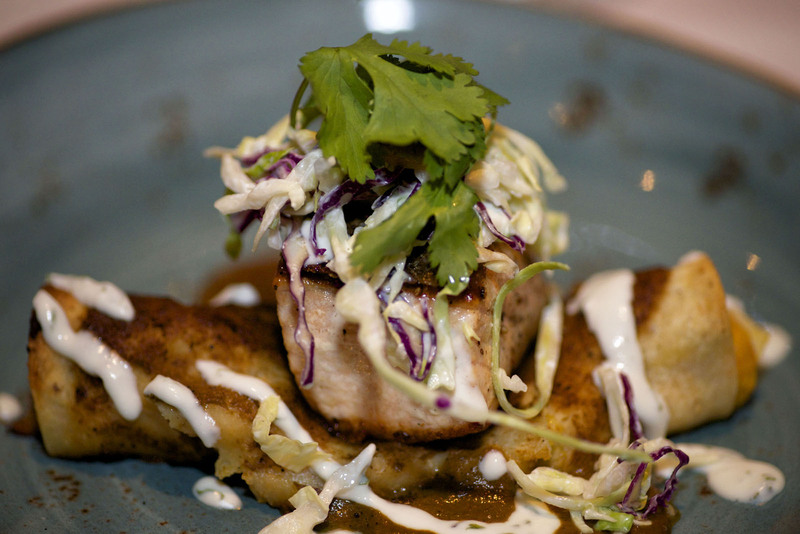 The Scottish Salmon is served over butternut squash and green onion enchiladas. It has pumpkin mole and pickled vegetables. The pumpkin mole is what took this dish to bragging levels. It had that really nice sweet pumpkin taste that balanced everything else out nicely. The combination of the enchilada and the salmon was a nice idea that worked brilliantly. This is my personal favorite entrée that I’ve had at Paul’s Kitchen. The desserts were all terrific at Paul’s Kitchen. 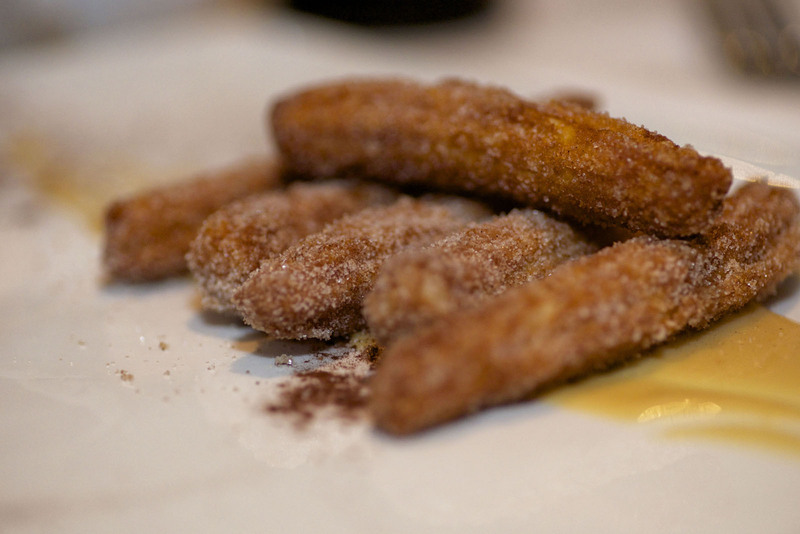 I’d highly recommend the churros which are called “milk and cookies” on the menu. They bring out this huge vile of Mexican hot chocolate on top of dulce de leche and you dip or pour it over the crunchy churros makes it heavenly to finish your meal with. I liked the Eton Mess even more than the milk and cookies though actually. 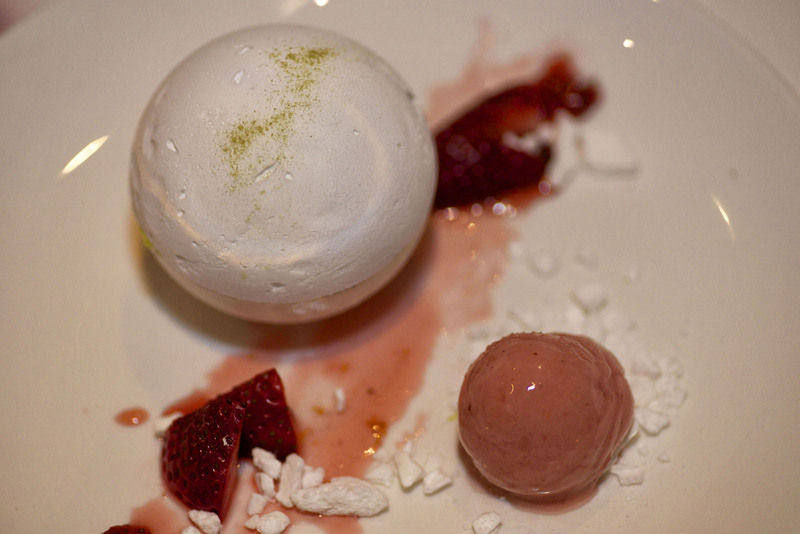 It’s a candied shell filled with green tea mousse, strawberry preserve, and crunchy meringue. 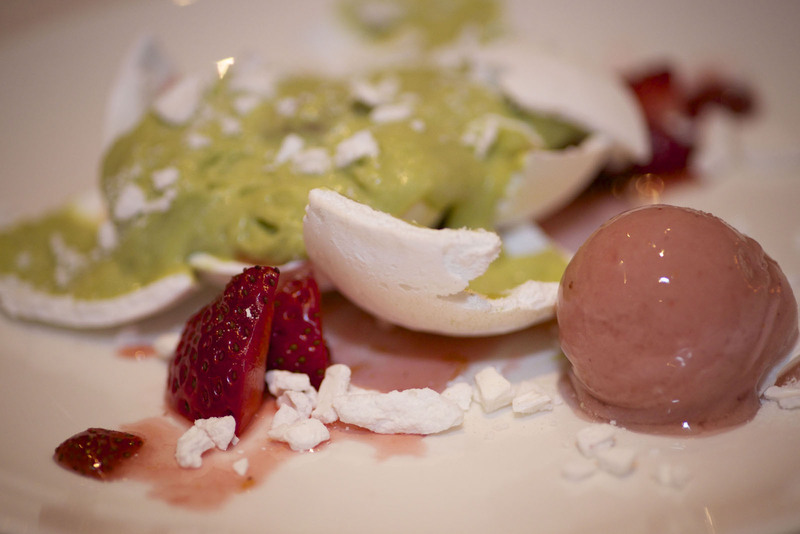 It is served with fresh strawberries and strawberry sorbet. The blend of all the flavors makes this dessert extremely unique and something most people haven’t seen on most dessert lists. I had to add two pictures to make sure that you could see what you’re dealing with once you crack open the shell. Paul’s Kitchen is a restaurant that is making a lot of waves in Houston right now and for very good reasons as you can see. One of the things I like the most about this restaurant is the attention you get from the staff. One of the few restaurants where everyone goes way out of their way to make sure you’re more than taken care of and enjoying the experience.